Eureka! : Hundreds of years after it was discovered in North Carolina, you can still pan for gold at numerous sites. Go to www.visitncgold.com to learn more about the North Carolina Gold Trail. Good Prospects: Morganton offers a free panning area where Smith Creek, home to many gold discoveries through the years, enters the Catawba River. It’s been a long time since the United States’ first gold rush, which took place in the North Carolina foothills in the 1790s. But if you look hard and know how to, you can still find gold in WNC today. The region’s reputation as a draw for treasure hunters recently got a major boost with the creation of the North Carolina Gold Trail, which touts the state’s gold mining heritage and hot spots. The campaign has been spearheaded by Michelle McConnell Yelton, executive director of the Rutherford County Tourism Asset Foundation, who built on the efforts of others to put the state’s gold scene in a shinier light. “The goal is to collectively bring more attention to North Carolina’s gold history, to pool our resources to promote it as one larger concept and as a regional experience,” she says. The trail is comprised of a growing network of historical locations and contemporary gold-mining sites. So far, it touches on six counties, with an emphasis on key spots that have bathed in the luster of the precious metal. The initiative’s ever-growing itinerary highlights WNC locales in Burke, McDowell, and Rutherford counties (find them at www.visitncgold.com). In Burke, the city of Morganton has a free public gold-panning site next to its greenway along the Catawba River, as well as a downtown outfitter, Smokefoot Trade & Loan, that blends a traditional pawnshop with a one-stop shop for prospecting gear. In McDowell, there’s Marion’s Lucky Strike Gold and Gem Mine, where visitors can try their luck for a fee and learn the tricks of the trade. 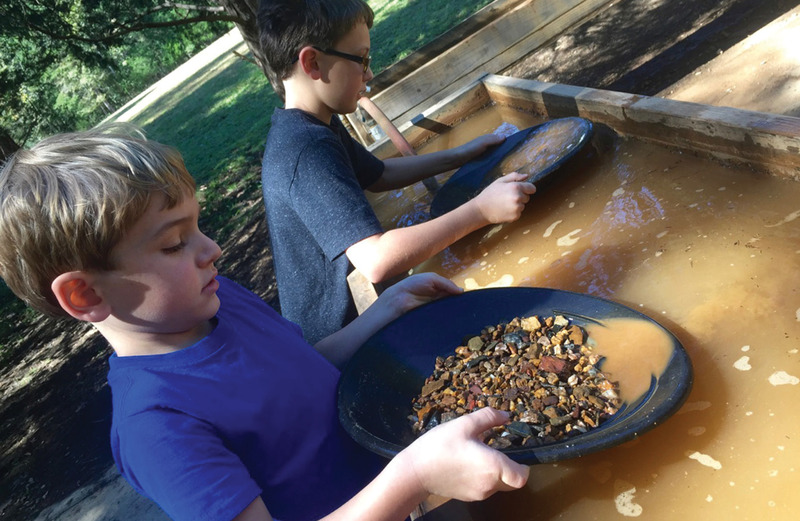 And Old Fort’s Mountain Gateway Museum hosts the annual North Carolina Gold Festival, which returns on June 3 to alleviate gold fever with workshops, demos, and entertainment. Rutherford is home to several sites that pay tribute to the Bechtler Mint, one of the country’s primary sources for gold coins in the 1830s, and the Thermal City Gold Mine, another standout for recreational prospecting.